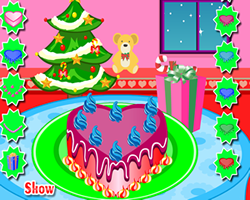 Description: Get into the holiday spirit in this special edition of your favorite room-decorating game! Click on the catalogue to the right to choose your items. Click the arrows in the upper-right corner to choose a location: would you rather have a beach house, penthouse, or an underwater house? Change music styles by clicking on the jukebox or stereo. Paint your items and walls your favorite colors with the Brush and Wallpaper buttons. Click the buttons at the bottom to rotate furniture, delete items, or print your room.